All attorney listings are a paid attorney advertisement, and do not in any way constitute a referral or endorsement by an approved or authorized lawyer referral service. The information provided on AbogadosLegal.com is not intended to be legal advice, but merely conveys general information related to legal issues commonly encountered. Please contact a local attorney in your area for official legal and law information. AbogadosLegal.com regards your privacy seriously. By visiting AbogadosLegal.com, you are accepting the practices described in this Privacy Notice. What Information About its Visitors Does AbogadosLegal.com Gather? This refers to any active information you choose to provide in order to gain the full use of the website (contact a lawyer) or through our contact forms. Generally, we require you to disclose your first and last name, address, city, state, zip, country, phone number and email address. Optional information disclosed includes: company name, province, fax number and any legal/personal information that will help the lawyer. If you choose to post information through our website(s) or maintain email, postal mail or telephone contact with us, we may retain such information also. Does AbogadosLegal.com Share the Information it Receives? Unless it is necessary in order to provide you with the service you requested we will not disclose your personal identifying information to any third party. A limited number of AbogadosLegal.com employees, such as customer service representatives, and IT personnel, may have limited access to personal identifying information maintained on our systems, but all are required, by written agreement and subject to substantial penalties, to keep such information strictly confidential and to use it only as a necessary to perform their duties relating to the service that you have requested. AbogadosLegal.com will never share personal medical or financial information with third parties. How does AbogadosLegal.com use My Information? Your personal information is used to send your requests for information only to the lawyers and legal specialists you choose to contact. This information will also be used to pre-fill forms on the site to make filling forms easier for you, and we will use this data to customize the information on AbogadosLegal.com to your personal interests. We share aggregated demographic information about our user base with our partners and advertisers. This information does not identify individual users. 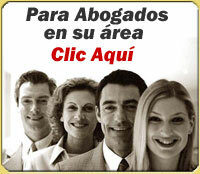 Our advertisers are lawyers and specialists within the legal field who advertise their services on our site. Our partners are companies we work with, who sponsor their services to our advertisers and site visitors. AbogadosLegal.com's aggregate data is usually shared with these advertisers and partners in a report for the purpose of describing the sites visitors and usage. In the event AbogadosLegal.com goes through a business transition, such as a merger, acquisition by another company, or sale of all or a portion of its assets, your personally identifiable information will likely be among the assets transferred. You will be notified via prominent notice on our Web site for 30 days of any such change in ownership or control of your personal information. Your postings on this site and other communications you may have with us via email or postal mail may not be secure unless we advise you that security measures are in place prior to your sending information. No person under 13 should disclose information on this site. If we learn that we inadvertently have collected personal identifying information from a child under the age of 13, we will promptly delete that data from our systems and databases. We have links to other websites through our site. When you do so you are doing so subject to their policies regarding privacy and data collection and you should read those sites' privacy policies to make sure you agree with them before using or making purchases. Can I Choose to Not Receive Certain Information and/or Opt-out? In order to provide lawyer location or educational services, we may on occasion supplement the personal information you submitted to us with information from third party sources.